This Belongs in a Museum is not your typical tile-laying game. Built on the familiar mechanic of placing tiles to create the board as you play, we’ve added some fun, new twists to this beloved game genre. Some of the tiles in This Belongs in a Museum have action icons on them that give you an additional benefit when placed. This allows you to manipulate the board as gameplay progresses and create an ever-shifting landscape of give and take between the players. The Rotate Icon allows you to choose a tile in play (already placed) and rotate it in place any direction to change how it lines up with the tiles around it. The Swap Icon allows you to choose TWO tiles in play and switch their locations, placing them back in any way you like. You can rotate them to create new connections beneficial to your scoring or detrimental to an opponent. The Replace Icon allows you to pick up a tile in play and put it in your hand for later use, replacing it with a tile from your hand. If the tile you place has an action icon on it, you do NOT get to then use that action as well. There are a few limitations: You cannot use the action icons to move or manipulate the Mummy Tomb, Base Camps, or any tile with an Archeologist or Mummy on it at the time the action tile is laid. In addition to laying tiles for points, each player has an Archeologist character they bring into the game when they place their base camp tile. The archeologist is moved around the game space to collect artifacts for extra points. Your archeologist can also block other player’s options by being in the way of moving their archeologist. Also, any section of your color occupied by your archeologist is considered connected back to your base camp for scoring. Collecting artifacts adds points to your score and adds another layer of strategy to your gameplay. There are eight different artifacts in the game. During set up, you will choose 5 artifacts at random from your archeologist’s set. Those are the 5 artifacts you will be trying to collect throughout the game. You need to move your archeologist to land on the artifact spaces on select tiles to collect that artifact and score the points for it at the end of the game. Collected artifacts are worth 3 points each. Mummies act as boons or foils to scoring sections of connected dig sites. You can move ANY mummy by forgoing the action permitted by an action tile and choosing to move the mummy instead. Placing the mummy of YOUR color on another player’s dig site section pulls the scoring for that entire section to you. If another player’s color mummy is in one of your sections at the end of the game, they earn the points for that section that otherwise would have gone to you! In the above image, the green area surrounded by the yellow line illustrates a scoring section that would steal points from the green archeologist and give them to the blue archeologist because the blue mummy is occupying that section. Mummies also block movement. Archeologists cannot move through a space occupied by a mummy. Any same color dig site that is directly connected to the site the mummy occupies is considered cursed and inaccessible. In our example above, the entire green section surrounded by the yellow line is considered impassable. Note: tiles connected via airports, rivers, or mountains are not considered cursed and can be moved through. Mummies and Archeologists affect which tiles can be manipulated via action icons. Any tile that is occupied by either a mummy or archeologist cannot be rotated, swapped, or replaced. This applies to only the specific tile the mummy or archeologist is on, not an entire section connected to that tile. Oh, and did we mention you can get all this for $24.99? Ask for This Belongs in a Museum at your Friendly Local Game Store or order online to have the adventure delivered right to your door. Looking for something new and different to play this weekend? Check out the praise Element is receiving and move it to the top of your list! If you want to play Element at YOUR next game night, ask for it at your Friendly Local Game Store. See our retailer map for a store near you. Already playing and loving Element? Share your opinions on Boardgamegeek.com and/or Amazon to help your fellow gamers decide to add it to their collections as well! Get ready to haggle in Hafid's Grand Bazaar! We are pleased to announce Hafid’s Grand Bazaar, coming September 2017 from the creative team that brought you Element! Bid, haggle, and trade your way to the top in this raucous trading game of set collection and player negotiation for 2 to 6 players. Acquire spices, textiles, livestock and other exotic goods by bidding on caravans from foreign markets across the ancient world. Manipulate the market – and each other – using your shrewd bargaining skills to trade with your fellow merchants and collect resource sets to maximize profits. This game is played in a series of rounds based on the number of players. Each round consists of four phases during which players will take turns bidding on caravans, influence, and customers; collecting goods from caravans; trading and negotiating with each other to collect sets of goods; and selling their goods for maximum profit. This isn’t your typical trading game, however, and player interaction can get raucous and wildly entertaining as players are encouraged to get creative in their haggling! The marketplace is dynamic and ever-changing. 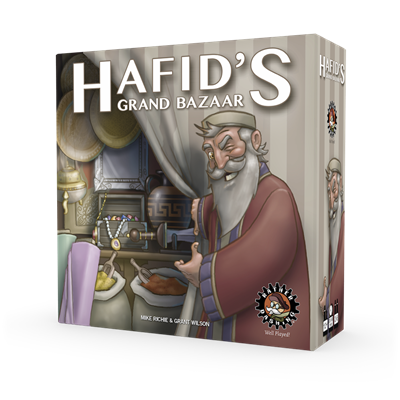 You will need to stay sharp and engaged to amass the most wealth and become the greatest merchant in Hafid’s Grand Bazaar! Follow us on Twitter and Facebook for updates on Hafid’s Grand Bazaar, including vidoes, photos, and more! 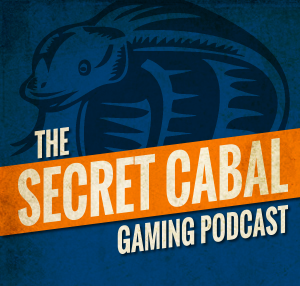 Look for it this fall at your Friendly Local Game Store!